Mahlon R. DeLong, professor of neurology at Emory's School of Medicine, was one of six recipients of the 2014 Breakthrough Prize in Life Sciences. Studying animals with a Parkinson's-like condition, neurologist Mahlon DeLong found that basal ganglia cells involved in movement control were firing excessively. Mahlon R. DeLong, MD, professor of neurology, Emory University School of Medicine, recently became one of six recipients of the 2014 Breakthrough Prize in Life Sciences. One of his first acts was to donate $250,000 of this award to support Parkinson’s research. 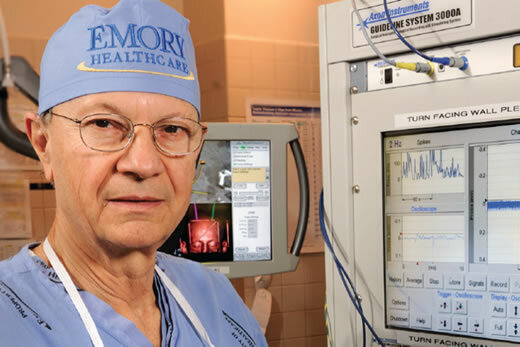 The DeLong Family Fund donated to two entities at Emory giving $150,000 to support the work of Thomas Wichmann and Yoland Smith in Parkinson’s disease research and $100,000 to the Emory Neuromodulation Technology Innovation Center (ENTICe). ENTICe is a collaboration of clinicians, surgeons, researchers and biomedical engineers engaging industry to get treatment tools to patients more quickly. DeLong was recognized with the Breakthrough Prize for defining and characterizing the circuits in the brain that malfunction in Parkinson’s disease. This scientific foundation underlies the circuit-based treatment of Parkinson’s disease by ablation and deep brain stimulation. "I am so thrilled for the international recognition of Dr. DeLong's lifelong contributions to the fields of Parkinson's disease and neuroscience that the Breakthrough Prize celebrates," says Robert Gross, MD, PhD, director and co-founder of ENTICe and professor of neurosurgery, neurology, biomedical engineering, and neuroscience at Emory University School of Medicine. "His generosity in supporting the center reflects his commitment to our mission—to develop novel devices and surgical approaches for the treatment of neurological and psychiatric disorders that afflict so many people." The $3 million prizes aim to celebrate scientists and generate excitement about the pursuit of science as a career and are sponsored by Silicon Valley titans Sergey Brin & Anne Wojcicki, Jack Ma & Cathy Zhang, Yuri & Julia Milner and Mark Zuckerberg & Priscilla Chan. DeLong was honored at a ceremony in Mountain View, Ca. in December. The event will be broadcast by the Science Channel, one of the Discovery networks, at 9 p.m. on Jan. 27, 2014.